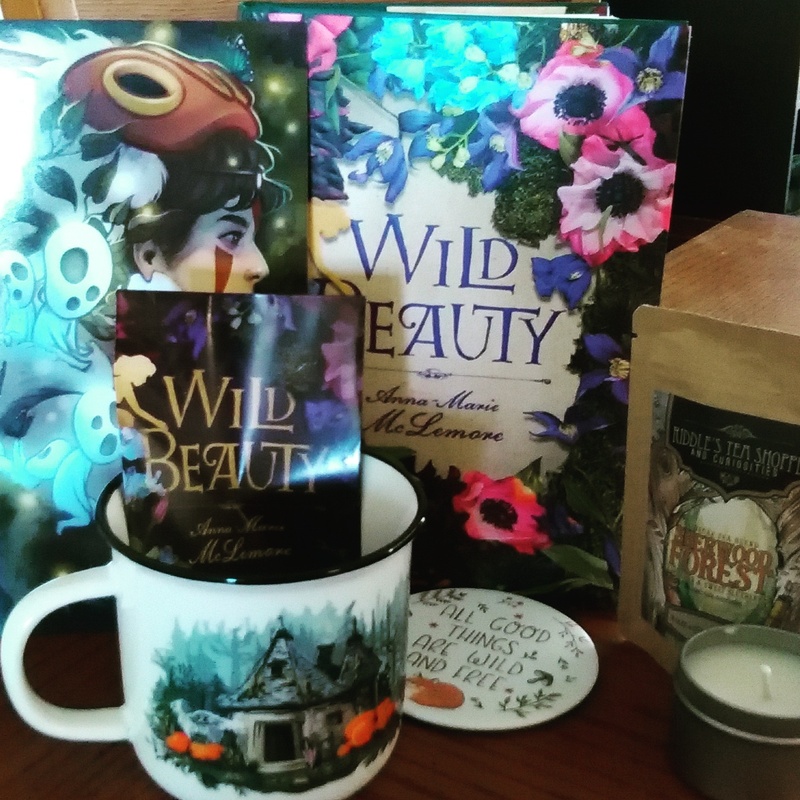 OwlCrate is a monthy subscription box where you get sent a new YA book and all sorts of cool merch and goodies, all pertaining to a certain theme. This month's theme was FIND ME IN THE FOREST! Here's all the stuff I got in my box this month. If you want to sign up for OwlCrate, their website is here. Wild Beauty by Anna-Marie McLemore. A magical realism story focusing on a family of women who can make beautiful plants grow anywhere they wish, but at a cost: they can never leave the grounds of their garden estate, and anyone they fall in love with will vanish. I've never heard of this book, but I'm excited to see what it's like -- the cover is gorgeous, and the plot sounds intriguing. A coaster with a cute drawing of a fox on it. A mug with a picture of the Hogwarts grounds on it. A tea blend that's inspired by Robin Hood -- the package says it's flavored to taste like blueberry pie, so we'll see how that works. A candle inspired by The Raven Cycle. An art print of San from the anime classic Princess Mononoke. Magnetic bookmarks inspired by Where the Wild Things Are (which I actually didn't realize where in there at first and nearly threw out with the box. Oops). There's also a preview for next month's theme: CASTLES, COURTS, AND KINGDOMS. Can't wait! Thank you so much for reading this unboxing post. If you liked it and would like to support my work, click on either of the buttons below to donate -- Buy Me a Coffee is a small, one-time donation, but becoming a Patron has several benefits and rewards. Either way, it's a huge help to me. A special thanks to those of you that choose to contribute!